In the last few years, barring a Singham or a Drishyam, Ajay Devgn has hardly done a film of consequence and one that commands a second look. His recent filmography which boasts of films such as Rascals, Son of Sardaar, Himmatwala and Action Jackson have given audiences severe grief. And therefore one approaches his latest venture Shivaay with some hesitation. It can’t be denied that the promos of the film did surprise audiences and created an enough good pre-release buzz for it. Interestingly, Shivaay also marks Devgn’s return to direction after U Me Aur Hum (2008). Shivaay (Ajay Devgn) is a fearless and a respected mountaineer well versed with the Himalayan landscape. In one of his trekking expeditions, Shivaay meets Olga (Erika Kaar) a Bulgarian national and they end up falling in love. This leads to Olga being impregnated and giving birth to Gaura (Abigail Eames). Several arguments and disagreements later, Olga heads to Bulgaria owing to her family responsibilities and leaves Shivaay to take care of Gaura. Several years later, Gaura learns of her mother’s existence and pleads Shivaay to take her to Bulgaria to meet Olga. Shivaay’s scuffle with the Bulgarian flesh traders leads to Gaura being kidnapped by them with Shivaay being determined to rescue her at all costs. As a director-producer Devgn has left no stone unturned in the making of the film, which was evident in the promos and also in the movie. It seems that Devgn has imbibed the knack of directing action scenes from his father and famous action director Veeru Devgan, which is visible throughout the film. Be it the opening sequence (which seems unbelievable, yet hooks you due to its execution) or Devgn’s fight with the henchmen of the flesh traders and the ensuing chase or the fight that takes place in a brothel, the action scenes are helmed with finesse and an elan that hasn’t been witnessed in Bollywood in a long time. Action directors Jai Singh Nijjar and Christian Petersson deserve equal applause for executing the action scenes flawlessly. One must also take note of Aseem Bajaj’s cinematography which does complete justice to the scale of the film and helps in making it the visual spectacle it is. One however wishes that Devgn and team had paid equal attention to the script (Sandeep Shrivastava and Robin Bhatt) as much they did to other technical departments. Barring Devgn and Gaura, rest of the characters including those of Erika Kaar, Saurabh Shukla, Sayyesha Saigal and Vir Das coupled with many of their lines come across as poorly written and could have benefited with better writing. Similarly, the love story of Shivaay and Olga comes across as half-baked with the actors having an unimpressive chemistry. One also wishes that the lead actor would have had a strong villain pitted against him rather a bunch of henchmen hired by the villain. On a similar note, the unveiling of the identity of the villain doesn’t take the viewer by much surprise, since the actor in question gives a one-note performance and like rest of the actors suffers from a half-baked characterisation. 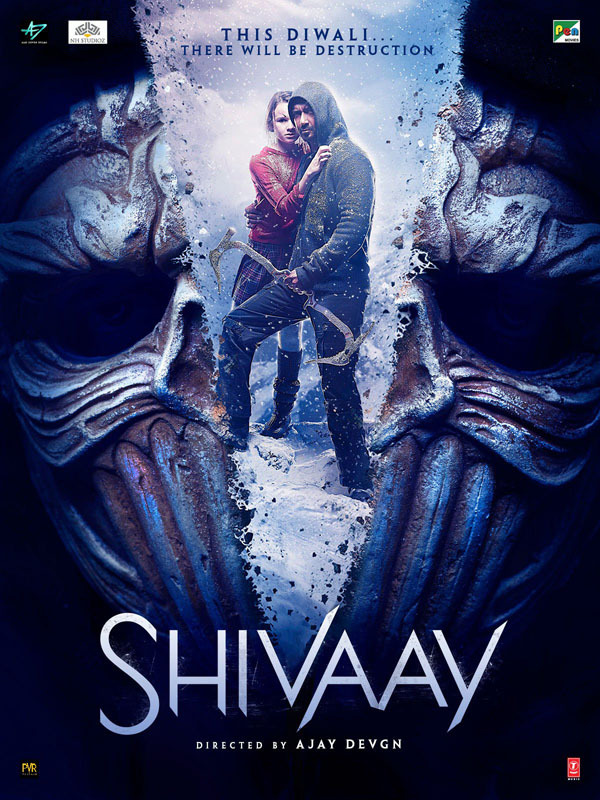 Though the promos seemed to indicate that the film is primarily set in the world of mountaineering, barring the first half hour or so, the film focuses on Shivaay’s attempts to rescue his daughter from the flesh traders and one can’t help but be reminded of Liam Neeson’s Taken as the film progresses. The film is a tad too lengthy, especially in the post-climax portion which never seems to end. It has been said that the makers have edited out a few portions and one only hopes this will help to make the proceedings crisper. Handling dual responsibilities as an actor and director, Ajay Devgn gives a fine performance after a while, though one wishes he had not sported that grim expression too often. Abigail Eames is likeable as Laura. While the rest of the actors including Girish Karnad and Saurabh Shukla fail to rise above their poorly written roles. Despite its shortcomings, Shivaay is lavishly mounted and worth a watch owing to its splendid cinematography, brilliantly executed action scenes and a larger than life scale. As a director, Ajay Devgn shows a flair for filmmaking and has made a film which is far better than most of his recent films. With a better script, we just might get to see Ajay Devgn as a far more evolved and efficient filmmaker. ← Doctor Strange (2016) Movie Review: Magic In Sparks!